Wheeling Downs still exists today, but it's been forty years since a horse has set foot on the track there, actually that track doesn't exist anymore. Todays oval has gone to the dogs, which are probably not long for this world either. 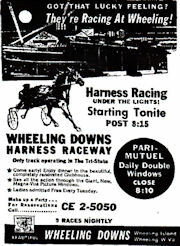 Wheeling Downs opened for thoroughbred racing in 1939 on a one half mile dirt oval, harness racing was added in 1961. In 1962 the original open air grandstand burned to the ground and Wheeling would not re-open till six years later. In 1968 a new grandstand that seated 2,500 welcomed back the thoroughbreds on New Years Day, the welcome would be short lived. At the conclusion of the 32 day meet , on February 16, the last thoroughbred race was run on the island, as the track was located on Wheeling Island, about 70 miles from Pittsburg, Pennsylvania. The harness horses hung on a little longer till 1975. Wheeling Downs had stables for 800 horses. The sounds of hoof beats both thoroughbred and standardbred are long gone and you'll probably be hard pressed to find someone who actually saw a race at Wheeling Downs but it still exist as a dog track and casino. Wheeling Downs was the only track in West Virginia that had pari-mutual harness racing. Wheeling Downs started thoroughbred racing on it's half mile oval in 1937. In 1962 the facility was damaged by fire and not re-opened until 1968 when a short thoroughbred meet returned on January first. Another short meet was run in 1969 and that was it for thoroughbred racing. Harness racing survived until 76 when the track converted to dog racing, which still run on the track. Wheeling Downs was granted a racino license in 1994 and now runs a dog racing casino venue. At some point Wheeling Downs was renamed Wheeling Island. I have made it to Wheeling Island, and it is an island. The interstate runs across the island but there is no exit on the island. You have to exit before or after and take one of the state roads to get there.